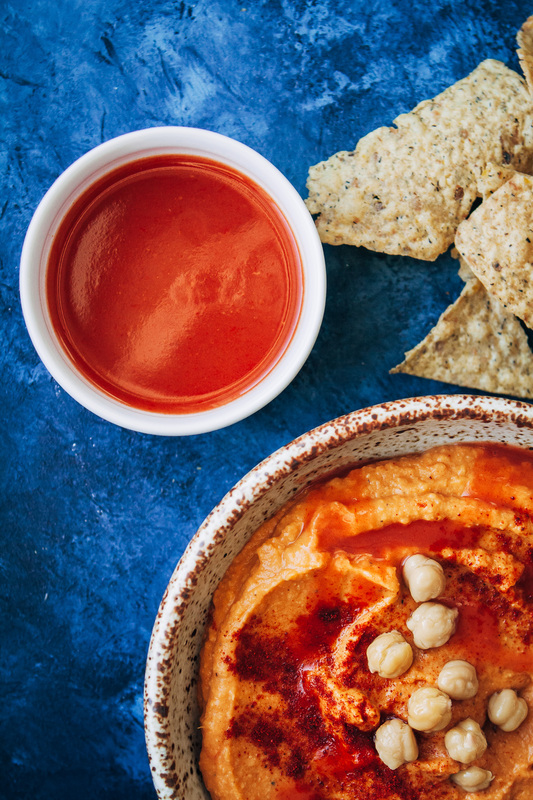 This Spicy Vegan Buffalo Hummus is the perfect dip for tortilla chips, pita, or veggies! Hi folks! It’s so great to be here twice in one week! I used to post three (!!) times a week back in 2016 because I had so many recipes coming out of my kitchen. 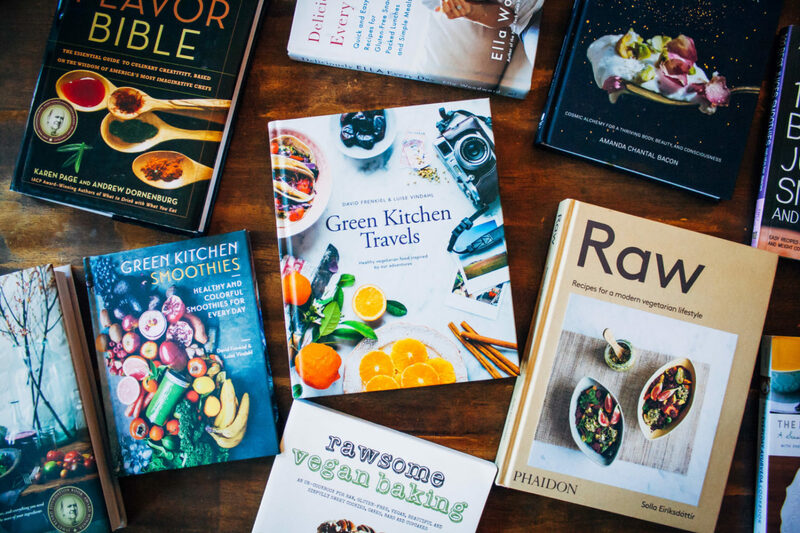 I’m not working at such a frantic pace anymore, but I DO have a lot of great recipes I want to share this fall! However, this spicy vegan buffalo hummus is one that I’ve had in my back pocket for over six months. What you see here is actually the third photoshoot for this recipe! I redid it so many times because I wanted the photos to reflect the absolute deliciousness of this hummus. I’ve been trying to post more buffalo recipes lately because hot sauce is life, amirite? 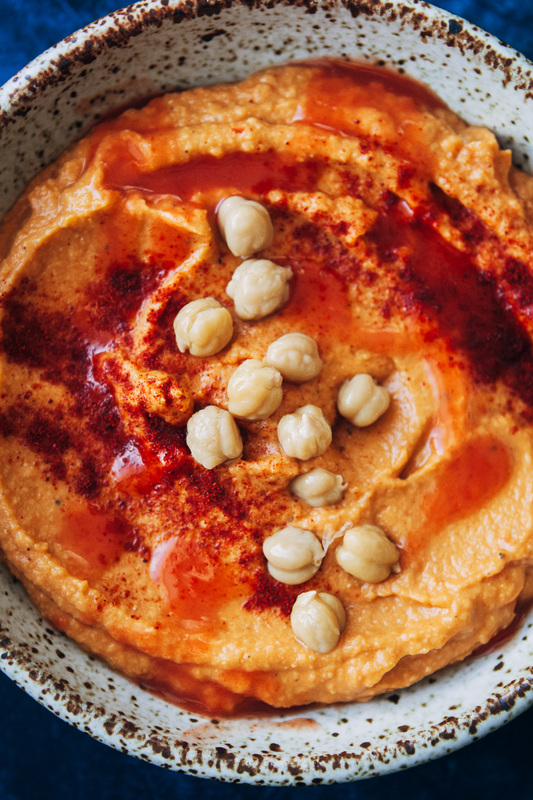 I have these buffalo cauliflower tacos and buffalo chickpea wraps on my blog already, but I make this hummus all the time because it’s such a quick and easy way to eat buffalo sauce! I actually think the next step will be to make a baked buffalo chickpea dip, which would be perfect for football season! Something I was reflecting on that I wanted to share with you today is how important it is to me to spread positivity out to people. I’m not going to lie to you, in the past year I was not fulfilling that goal. I’ve had kind of a bad luck streak ever since I graduated from college, but it all really came to a head this year. My boyfriend faced a really big problem and it was so hard to see him go through that. Then I was diagnosed with a rare bone disease (after MONTHS of going to doctors who told me it was nothing) and had to get surgery. And then I found out that my dog – who is absolutely everything to me – had been injured in an accident while she was being watched by someone else. She almost could have died. Finding out what had happened to Ivy was, and continues to be, so heartbreakingly difficult. Even months later I still have nightmares about what happened. Every other day I’ll just break down and cry while petting her, thinking about it. I thank God every day for sparing her life and sending His angels to protect her. But suffice to say, it’s been a really rough year for me and I haven’t been the most positive. I’ve always been the type of person who sees bad things happening on the news and lets it affect them. I see so much suffering in the world (especially when it comes to animals), and I don’t know how to live with it. I don’t know how to help them. And over the past year I’ve been so busy trying to help myself and just get by that helping others has taken the backseat. But the more I work on the blog and connect with you all, the more I realize that THIS is a great way I can help people and animals. Eating a plant-based diet has been unequivocally proven to improve health, reduce environmental impact, and save animals. In my most popular recipe, I posted this vegetarian calculator that shows how many animals you save and how much less CO2 you put out into the environment by choosing a vegetarian or vegan diet. I love this calculator because it shows how much one person can make a difference!! If you’ve ever said to yourself, “I want to go vegetarian, but it won’t really make an impact.”, then please check out this calculator. It really is amazing how much one person can do! 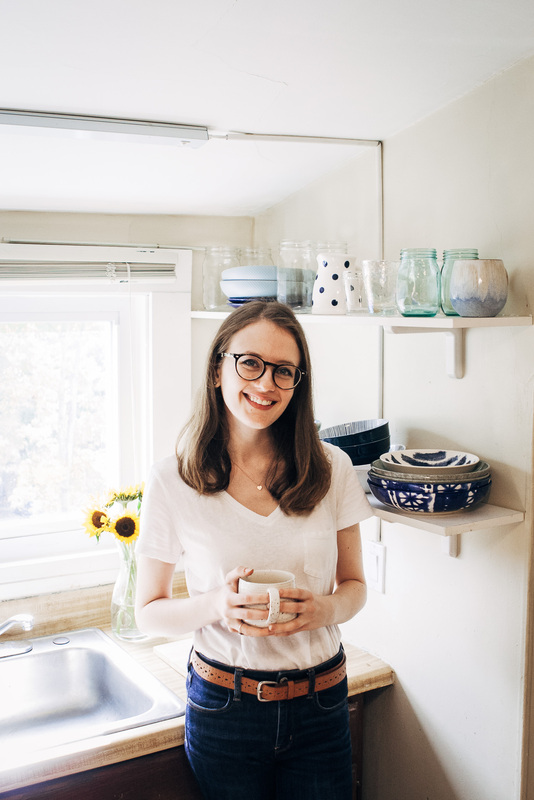 Another way I hope this blog helps people is by bringing them the joy of eating something delicious. 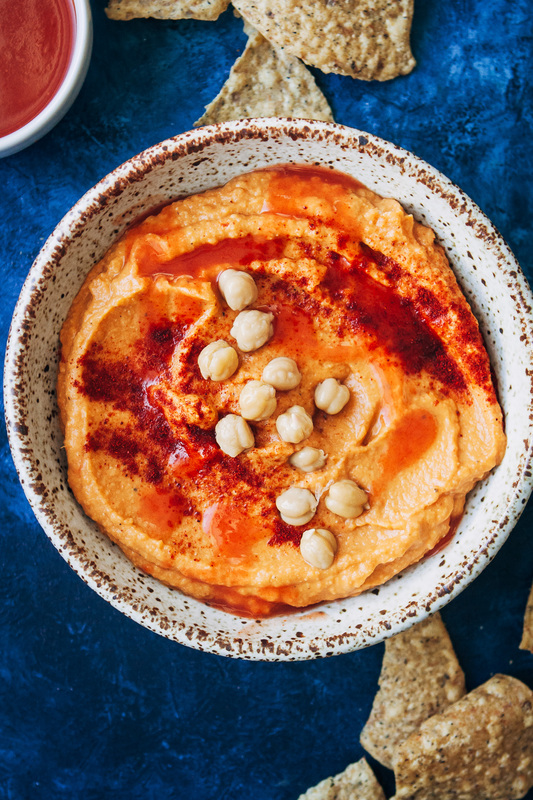 I don’t think you could eat this vegan buffalo hummus and be in a bad mood, lol! All joking aside, I love the power of food and how it allows people to connect with each other. Food is such an amazing way to show someone you care about them. And by sharing these recipes with you, I hope I can show how much I care about YOU!! To serve, garnish with chickpeas, paprika, and extra hot sauce. For this recipe I used Frank's Red Hot sauce, but any brand of similar hot sauce would work! Sarah, sorry for the difficult year you have had. Hope things will be better soon. Looking forward to trying this recipe. Thanks for sharing.